This article will show you two ways to add and manage interest charges for a patient’s case file with overdue invoice balances. In Universal Office, interest charges are calculated when an invoice isn’t paid by the end of the grace period. The grace period, minimum interest charge and interest rate can all be configured from the Interest Charge Preference Settings. To perform the following procedures, open the Patient Manager and select a patient’s case. From the Account Activity tab, select the Invoices & Payments tab. Click the [New Invoice] button on the toolbar. Select Interest Charge from the Template type drop-down menu and click Open. Note: Based on your Interest Charge Settings, invoices that have outstanding balances exceeding the set grace period will be displayed with the interest amount calculated. If you don’t see any invoices, this means that based on your Interest Charge Settings, all invoices for this patient’s case are still within the grace period or have not reached the minimum interest charge amount. In addition, if an invoice had already an interest charge applied, it will not be listed on any other interest charge invoices. Ensure the Bill To information is accurate. Check the box beside one or more unpaid amounts or check the Select All box. Note: When multiple interest amounts are selected they will be combined into one Interest Charge Invoice. If a payment has been received, click the Pay button to apply it. Tip: To learn how to record payments, see the Recording Payments article. 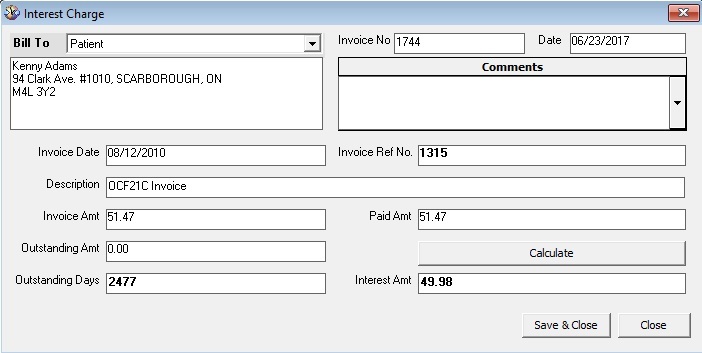 Click Preview to print or export the interest charge invoice. Click Save & Close. A new Interest Charge Invoice is created. 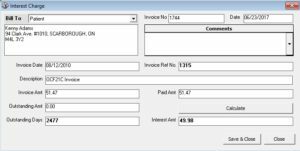 Note: The interest charge is also added to the original invoice total and can be viewed in the Balance column or by opening the invoice and navigating to the Grand Total section. Open an invoice with an outstanding balance. Note: Interest cannot be added to invoices in Created status. Navigate to the Invoice Grand Total section and click the Invoice Interest button. The Interest Charge window opens with the interest calculated based on your Interest Charge Settings. Note: Interest charges will only be calculated when the set grace period has been exceeded and the minimum interest charge has been reached. Click Save and Close to apply the interest charge to the total. Tip: Click the arrow next to the Invoice Interest button to Modify or Delete the interest. Click Close. 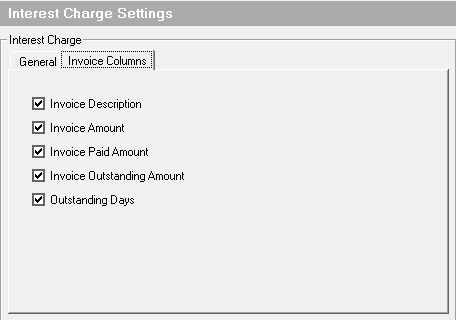 A new Interest Charge Invoice is created and can be managed from the Invoices & Payments tab. When it comes to assessing interest charges, you have a few options that allow you to modify the way interest is calculated in Universal Office. From the list on the left select Interest Charge Settings. Select to calculate charges from Created or Sent Invoice date and optionally check the Mark interest charges invoiced “To be printed” box. 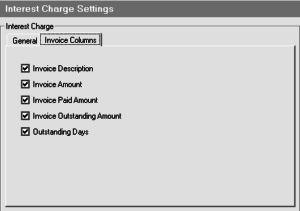 Tip: Select the Invoice Columns tab to select columns to display in the interest charge invoice.